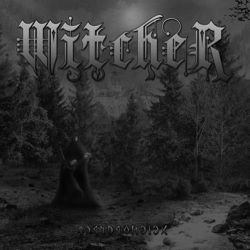 WitcheR is a new atmospheric melodic black metal band from Hungary. They were formed in 2010, when Roland Neubauer (vocals, guitars, drum programming) and Karola Gere (keyboards) decided to join forces. They are the only band members since then and they have released several demos, many of which were re-released in various formats, an EP in 2012, as well as 2 split albums in 2012. Their second demo “Boszorkánytánc” was released in 2011 on tape and in 2012 on CD with one song less. On April 2013 it was re-released officially by Mercy Despise (a Nihil Art Records sub-label) and Dark East Productions, as the debut full-length album of the band. Their music is slow to mid-tempo synth-based atmospheric black metal with an underground aesthetic. “Boszorkánytánc” includes 6 songs, lasting for over 52 minutes. Apart from a short intro and outro, there are 4 very long tracks, each one over 10 minutes. Karola’s melodic synths totally dominate WitcheR’s sound, adding an almost orchestral touch to their music. Actually there are many parts in their compositions, including the 13-minute instrumental track “Boszorkánytánc (Witchdance)“, where they use only keys, without any other instruments or vocals! Their synths are mostly used as a symphonic ambient soundtrack-like layer with classical music references; there are a few parts where they also play lead piano melodies. Their guitars have a more rhythmic accompanying role, with nice melodic riffs and a quite distorted sound. The most extreme element of their sound is Roland’s screaming vocals that fit perfectly with the dark depressive atmosphere of their music. I prefer the more “metal” parts of their compositions and I like the contrast between the warm sound of their guitars, the bitterness of their screaming vocals and the melancholy of their melodic synths. All of their lyrics are in their native language, Hungarian, included in the booklet. I hope the band improves a little its production in the future, because there are many beautiful melodies in the songs that would benefit from a better, clearer and more natural sound. On the other hand, it’s only their first work and actually it was recorded in 2011 as a demo, so the sound is more than ok. WitcheR is a band that fans of atmospheric synth-based melodic black metal should check. “Boszorkánytánc” is released in a jewel case edition, limited to 500 copies, with 4-page black & white booklet, illustrated by Simon Krisztian. If you are interested for more info you can visit their official site in the links below.